Facebook is on top in a new survey by UTA Brand Studio and uSamp in the category of “attachment to a brand”. That refers to the degree to which people believe a brand is like themselves and the degree to which thoughts and feelings about a brand come to mind. Research from USC Marshall School of Business suggests that attachment is a better predictor of customer loyalty and customer evangelism. 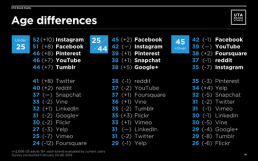 Instagram came in second, unless you are over 45, where it’s fifth and Youtube is second. 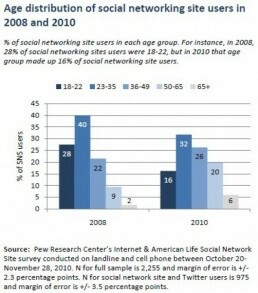 Instagram is actually number one for the 25 and under crowd. I guess that’s why Facebook bought Instagram. The most surprising find was with Twitter. In the 25 to 44 age group, it ranked tenth, but six of ten people say they use it. 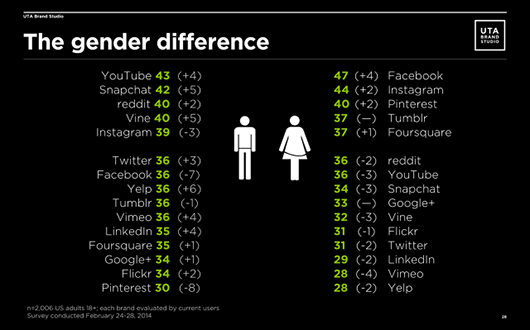 Also surprising to me is how low Facebook ranks among men. Predictably, Youtube scored well. It’s hard not find videos to “attach” to on Youtube, which would cause people to rank it higher. 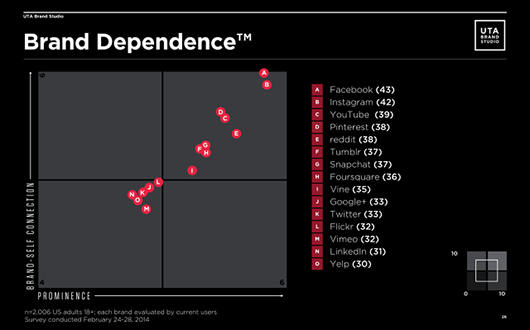 Brands that show the most potential based on Brand Dependance values were Reddit, Snapchat, Tumblr and Vine.